Our exclusive parking service, simply drop off your car keys and we’ll do the rest. Meet our easy, hassle-free service perfect for getting you away in no time. No waiting for transfers, the drop-off point is conveniently close to check-in with added peace-of-mind thanks to a camera to note your car’s condition. When you land back at Yorkshire’s Airport, your car will be waiting just outside the terminal ready to drive home. After a vehicle scan in our camera booth, you’ll leave your car in a drop-off lane a short walk from the terminal for a member of our trusted car park team to park it for you. After leaving your keys at our terminal reception you’ll be ready to fly. Follow the Meet & Greet car park signs from Whitehouse Lane. As you enter the approach road, stay in the right-hand lane and continue to follow the Meet & Greet signage. Take your 2nd right to enter through the right-hand barrier and take a sharp right turn into the Meet & Greet vehicle check unit. The drop-off lanes are a 0-2 minute walk directly in front of the terminal building. You’ll find our terminal reception just inside the entrance to the terminal, to drop off your keys. Available exclusively online, guarantee your space when you pre-book. Simply enter your time of arrival and return to get your quote and book. So we can provide the best possible service, Meet & Greet is not available to turn up. To use this car park please ensure you pre-book online. Great experience, just turn right after the barrier and enter the scanning tunnel, after which you are told which lane to park in. It's then a short flat walk to the terminal entrance and left towards departures where the Meet & Greet desk is. You are given a card to present on return and shown on a map which space you are in (these are just outside the terminal entrance). No messing, no fuss just polite professional but friendly staff. Would not consider parking anywhere else now. Please follow the instructions on your booking confirmation as these will detail specific information for each car park. Directions can be found on each of our car park website pages too. All our car parks are open 24/7. Can I turn up and park? Turn up parking is available at our Long Stay, Mid Stay, Short Stay and Premium Short Stay parking options. Any tokens taken for these car parks will be required for exit. What happens if I pick up my car late? We know that sometimes our customers arrive back a little later than intended so we allow a short grace period free of charge. If you need longer, the car park barrier on exit will calculate the overstay price for you, so you can simply make payment on your way out. Are there any height or width restrictions? Can I turn up on the day for Meet & Greet or Viking Airport Parking? Meet & Greet and Viking Airport Parking is available to book exclusively online. Bookings must be made at least 4 hours in advance of arrival. 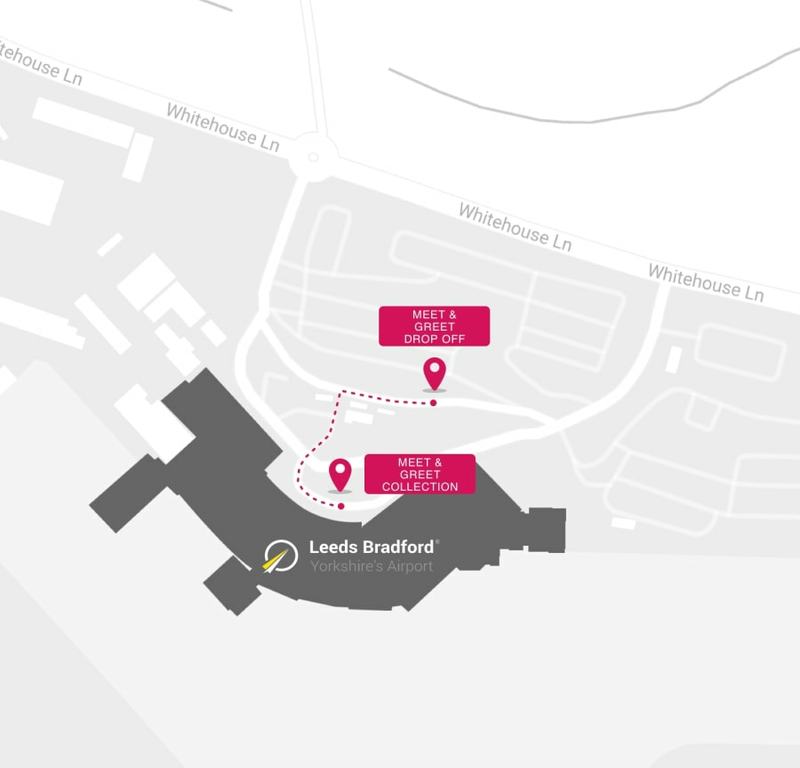 How does Meet & Greet work at Leeds Bradford Airport? After a vehicle scan from our camera system, don’t worry about finding a space, as you’re invited to park in one of our drop-off lanes.